We are at the early stages of a transformation in energy use. A growing population with rising living standards is increasing the demand for energy. By the middle of this century, it is expected that three-quarters of the world’s population will be living in cities, up from 50% today. At Shell, we are working to help build a more sustainable energy future. The world’s population is expected to grow by around 2 billion people to 9 billion by 2050. As average living standards rise, more people will gain better access to goods and services, leading to increased energy consumption. 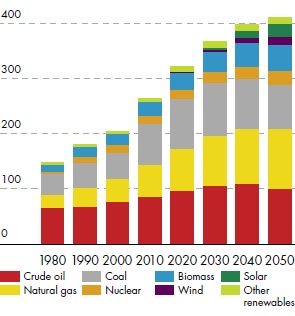 Global energy demand could increase by three-quarters over the next 50 years. This increasing energy use from the needs of a growing global population will have a long-term impact on the world’s resources. Shell’s New Lens Scenarios (see box below) say that demand for fresh water could increase by 40% by 2030; the United Nations says that demand for food could increase by 50% by 2030. Climate change will intensify the stresses affecting these resources. To help meet the growing energy demand fossil fuels are still likely to make up the bulk of the energy mix, with gas showing the biggest growth by mid-century (see diagram). Renewable sources, such as solar and wind, will continue to increase in the energy mix. Shell’s scenarios estimate that, with strong government support, energy from solar, wind, biomass and other renewables could rise to around 25% by 2050. Energy production is linked to both water use and food production. We have been bringing experts together from government, businesses and non-governmental organisations to understand and respond to the resource challenges and to explore new forms of collaboration. We continue to contribute to the public dialogue on energy and climate policy, and to participate in discussions to promote resilient systems. Our scenarios identify the key role of cities in the future. Most of the world’s carbon dioxide (CO2) emissions already come from cities, even though cities occupy less than 2% of the earth’s total land area. It is in cities, as centres of economic progress, where the greatest advances can be made. Yet cities will also suffer most from increasing pressure on resources. As small- and medium-sized cities grow, they face the challenge of becoming liveable while addressing potential resource pressures. Our work with governments, businesses and civil society is helping us to better understand how cities develop, and their impact on energy supply and demand. This creates an opportunity to build better transport infrastructure that has less impact on the environment. Effective planning of local infrastructure could help create conditions to reduce energy use and emissions. In the UK, for example, we have created the UK Resilience Challenge. This is a year-long collaborative programme, in partnership with a think-tank, which aims to understand the challenges of increased urbanisation and population rise in the UK, and foster ideas to address them. In 2013, we completed a joint study with the Chinese government’s Development Research Centre to determine the future energy needs of the country. The expected urban growth in China – an additional 350 million Chinese will inhabit cities by 2030 – will affect resource efficiency globally. The study found that with the right policies, choices, regulations and frameworks in place, China can accommodate its anticipated urban population growth through to 2030 without increasing its land use for urban living. The International Energy Agency says that unless governments change policy, the world faces an insecure, inefficient and high-carbon energy future. Without clear measures to promote investment in more efficient and low-carbon technologies, it risks setting itself on a course to potentially catastrophic climate change. We advocate publicly that a strong and stable price on CO2 emissions will help drive the right investment in low-carbon technologies. Support from governments is needed to encourage the development of cleaner fuels and ways to reduce industrial carbon emissions. Shell plays an active role in influential think-tanks, and with senior government officials and regulators to ensure our views on effective climate change and CO2 policies are understood. But we are not waiting for government policy to develop; we already consider a potential screening value of CO2 emissions at $40 a tonne. This is a guide that is used in all our investment decisions. Shell produces natural gas, the cleanest-burning fossil fuel, as well as low-carbon biofuel. We are also helping to develop carbon capture and storage technologies and working to improve the energy efficiency of our operations. For more than 40 years, Shell has been using scenarios to analyse current economic trends and project plausible pathways into the future. Our scenario building explores alternative visions of the future to help test, strengthen and influence our present business decisions. For example, our scenarios highlighted circumstances that made low-carbon biofuels look like an attractive growth business. This included rising energy demand and prices, and an increase in government mandates to reduce greenhouse gases. This influenced our decision to become involved in biofuels production. The New Lens Scenarios (see disclaimer), published in 2013, show two alternative pathways, called “Mountains” and “Oceans”, which detail a plausible energy future. They look beyond 2060, reflecting that the rising energy use of a growing and more affluent global population will have increasingly long-term impacts. Our scenarios help us to become better equipped to tackle future challenges. “Mountains” shows a world in which policy plays an important role in shaping the world’s energy system; whereas “Oceans” envisages market forces, rather than policies, as the basis for shaping the energy system. Both scenarios demonstrate that emissions will not meet the target of limiting CO2 in the atmosphere to 450 parts per million. This is the widely-modelled level of CO2 that could lead to a rise in global temperatures of 2 °C. During 2013, Shell spoke with leaders, academics, non-governmental organisations and businesses across more than 30 countries. We shared insights from the New Lens Scenarios about a future global energy system, discussing areas that include resilience, sustainability and better urban development. We assist some authorities, over extended periods, to develop scenarios for local decision making.